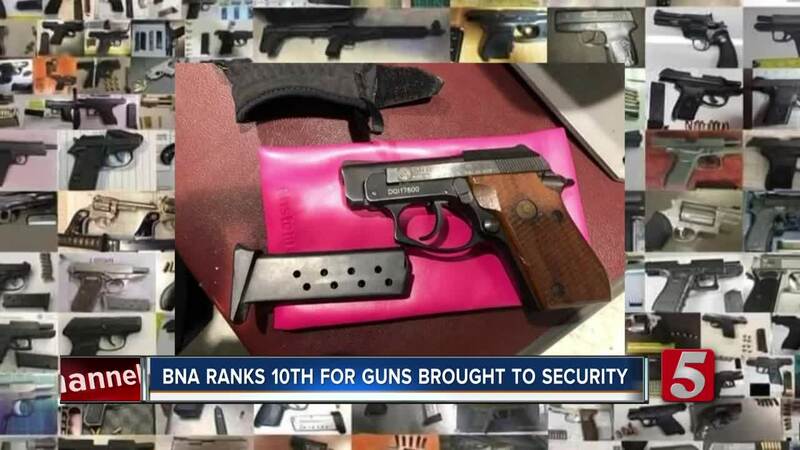 NASHVILLE, Tenn. (WTVF) — The Transportation Security Administration warns that improperly packed guns found at airports is a fast-growing problem nationwide. From 2017 to 2018 the number jumped 7 percent, to 4,239 detected by officers. Over the past decade, the number has quadrupled. In Nashville the problem could be even more dangerous. So far in 2019, more than 90 percent of guns found at BNA have been loaded. TSA says there is a right way to fly with a gun. "We dont want to infringe on anyone's right to take one with them when they travel," said TSA Regional Spokesperson Mark Howell, "we just want to make sure its done the safe way." In fact, local TSA staff say dozens of people fly properly with firearms every day from Nashville International Airport. But it's the 86 people who were caught trying to bring a gun through security last year that concerns them. "We actually had one individual last year who had it in their front pocket," said TSA Federal Security Director for Tennessee Stephen Wood. BNA is on track to leave its 2018 number in the dust, with 15 guns found already by mid-February. "It's typically 'I forgot that it was in my bag,'" he said. So why does Nashville have such a higher per-capita rate of firearms found at the airport than other, much busier airports? Wood, who is based in Nashville, thinks he knows why. "The local framework for statutes that we have, and the number of people who frankly carry firearms in Tennessee." The problem, he says, isn't that people want to travel with their firearm. It's that too many are doing it incorrectly, which also means illegally. And the trend is showing no signs of slowing down. "Last year (in 2018) in a 2-week period we saw about 3 guns on average... this year were seeing 5 for every 2 weeks," said Wood. It's a trend TSA hopes to change. If you want to travel with your gun, make sure it is unloaded. Pack it in a hard case with a lock and take the key. You can pack ammunition in the same case, just make sure it is secure. Bring your case to your airline's counter and declare it. They will likely give you a paper to fill out and put back inside the case. TSA suggests you then pack your locked case in one of your checked bags. And that you wait 10-15 minutes before going through security. If TSA notices any problems with your firearm, they will call you back to open the case. And you don't want to have to go through security multiple times. The biggest thing to know: never ever is a gun allowed in a carry on bag or through security. "I do have a high degree of confidence in the ability of our officers," Wood said, "if you bring it, we're gonna find it." If that happens, TSA will call police and can slap with with up to $13,000 in civil penalties. Sttep-by-step instructions on the proper way to fly with a gun, are listed on the TSA's website .